Where do I use my Warehouse Aquatics voucher code? Whilst the idea of having a pond or aquarium may sound like an exciting addition to your home, it’s important to be aware of the maintenance required to ensure and it keeps in the best condition possible. Warehouse aquatics is an online store that provides you with all the supplies you need to help maintain your ponds and aquariums an easy and efficient way. From Aquatic Fitter, decor, aquatic lighting, pond filters and pumps, the online store has everything your fish needs to swim freely. You can also find reptile feeding equipment and starter kits! 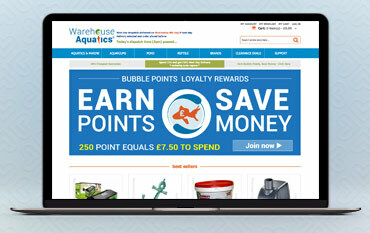 Boasting over 10 top brands, Warehouse Aquatics provide an amazing customer service too so if you need help or guidance on which products would be suitable for you, they can offer their advice along with deals on short-dated items giving you a chance to earn bubble points to save money! If Warehouse Aquatics sounds as interesting as it is, then check out their online store and don’t hesitate to grab an online saving using one of our Voucher Codes which you can find right here on our deals page. Warehouse Aquatics offer their very own Reward Scheme to show their appreciation for the loyal fish keepers who continuously support their business by purchasing their products. Within the Bubble Point Scheme, you earn 2 pence per every £1 you spend online which is a minimum of 2% equivalent. Some products even come with triple or double points during special promotions so when you spend online you really do save! If you’re looking to get the essentials you need for your aquarium or pond but don’t want to spend a fortune online, why not check out the Warehouse Aquatics clearance section where you can find great deals on a wide variety of products. What’s more, with a Voucher Code by us, you could knock your price down even more! All you have to do is check out our deals page right here and see what discounts you can find. Discover a wide range of top Aquarium brands in the Warehouse Aquatics Aquarium range including the likes of Juwel, biOrb, Tetre and many more! Find all the essentials you need to ensure your aquarium is up to speed including lighting, heat packs, decorations, cleaning materials and much more, all in one places. Shop quality brands for less too with a Voucher Code courtesy of us here at NetVoucherCodes and keep your aquarium in check for less. If you’re new to aquariums and looking for a fun addition to your home, this second-to-none collection is your first port of call! You can even shop for children’s themed aquarium sets. With aquariums varying in size, designs and features, you are sure to find something you love which will fit into your home perfectly so see what the Ware Aquatics Aquarium Range can offer you right now. Customers can return any item back within the first 14 days if unwanted. Customers must return the goods at their own costs in an unused and re-saleable condition. Any items returned without a confirmation email or any identification cannot be identified and will be placed back in stock. You will need to send Warehouse Aquatics an email at sales@warehouse-aquatics.co.uk to let them know you want to return your item, in your email please include your name, order number and reason for return. For over 5 years, Warehouse Aquatics have been supplying an abundance of aquatics products ranging from Pond Equipment, Aquariums, Reptile Equipment and much more! With an extensive knowledge of all things aquatics, the friendly team can also help advise you on their products and offer advice! Shop online using a Warehouse Aquatics Voucher Code and you could grab a great discount off your online order. Browse through the wide variety of products available and see what Warehouse Aquatics can do for you.